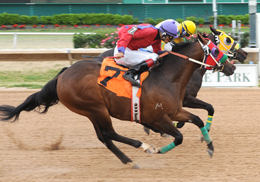 Paint Bug (#7) almost catches Trace Seis (#3) as the pair set the top two qualifying times for the Grade 2 Sam Houston Futurity at Sam Houston Race Park on Saturday. HOUSTON, TX�MARCH 30, 2013�Sam Houston hosted 15 trials today in preparation for the richest race of the 2013 Quarter Horse Meeting, the $452,800 Sam Houston Futurity (G2). The third trial of the afternoon produced the two fastest qualifiers when Trace Seis barley defeated Paint Bug by a head in a 330-yard trial time of :16.957 under rider Cipriano Vidana. The 10 fastest qualifiers from 135 two-year-olds who went to the post Saturday will return to the Houston raceway on April Saturday, April 13, to vie for the winner's share of a $452,800 purse. Paint Bug, a PYC PAINT YOUR WAGON colt out of Shays Luvbug by Mr Jess Perry, races for owner/breeder Alejandro Moya. Erasmo Hernandez conditions the bay colt that posted the second fastest time of :16.998 from the 135 two-year-olds who started in the trials. Alfonso Lujan had the riding assignment. Royally Painted, a daughter of PYC PAINT YOUR WAGON racing for owner/breeder King Camden Running Horses, Inc. finished third in the same heat to qualify with the 7th fastest time of :17.097 seconds. Alex Villarreal trains the filly out of Royal Time Separatist, by Separatist. Luis Vivanco had the riding call. For the list of the ten fastest qualifiers with owners, breeders, jockeys and trainers CLICK HERE.